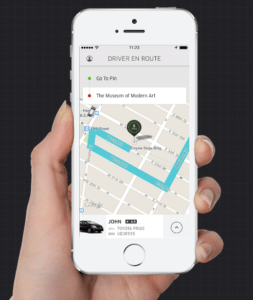 GPS fleet tracking with Goose is as simple as downloading the app, similar to Uber. Goose by FieldLogix adopts the user-friendly Uber experience between company drivers and their customers! These apps contain similar features to keep your drivers happy and your customers coming back. Why do customers enjoy Uber and Goose so much? Available on Android and iOS, both Goose and Uber connect customers with drivers. Using their phone’s GPS capabilities, these apps let the customer know their driver’s ETA (estimated time of arrival) and removes the question of when the driver will actually arrive. This is perfect for customers with a busy lifestyle so they can continue their day without interruptions. Additionally, Uber and Goose have added safety precautions which allow customers to view a photo of the driver along with contact information so your customer can feel safe knowing who to expect at their home. After the service, customers have an option to rate their experience on a 5 star scale which companies can keep for review. Customer comments and ratings give managers and owners a better idea of how their employees are interacting with customers. Why do drivers sign-up with Goose? Goose simplifies the dispatching process so your drivers can focus on their job. Goose allows your drivers to view a list of their stops, review special instructions for the job, and utilize turn-by-turn navigation. Once your driver arrives your customers will be happy they didn’t have to sit around for a 4 hour time window, making life easier for your drivers. Additionally, Goose instant updates and user-friendliness helps dispatchers and drivers communicate quicker. They can complete more jobs and enjoy their day with less hassle. How much does Goose cost? Your drivers simply download the Goose app on their smartphone or tablet device to get started. There’s no down-time for installation or hardware costs, just a low monthly fee for the service. Better yet, you can try Goose by signing up with a 7 day free trial here!